Bundle into a plush, oversized turtleneck pullover for late-season trips to the mountains. 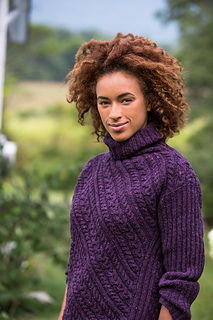 Laura Chau puts a surprising slant on uncomplicated cables and ribs by working Bracondale’s front and back on the bias. The sweater begins with the ribbed side panels, back, and front worked individually and seamed together. 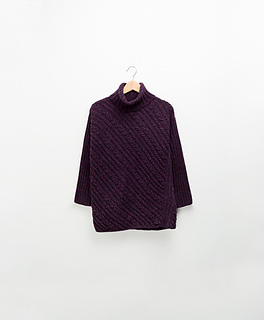 The ribbed sleeves are worked in the round from stitches picked up at the armholes; the turtleneck is picked up and worked in the round, then completed with a tubular bind-off for elasticity and a professional finish. An integrated i-cord hem lends polish and stability to the lower edge of the garment. We styled Bracondale with five inches of ease; choose a size closer to your actual measurements if you prefer a sleek fit. Knit it in a richly saturated hue from the Shelter palette or opt for an elegant neutral.